Odds are, you’ve noticed yoga and martial art studios popping up like Starbucks® in your neighborhood. Or maybe you’ve noticed that Sunday Tai Chi class in the park being populated by increasingly younger, fitter practitioners. Mindful exercise techniques may date back as far as 3rd millennium BC in Asia, but they’re only now really starting to take hold in the West. And that’s just great, because we simply can’t ignore the insurmountable research that suggests we need the knowledge and benefits that these practices provide. So which one is right for you? Let’s take a look. –Strengthens the body. In a Japanese study, 113 older adults were assigned to different 12-week exercise programs, including Tai Chi, brisk walking, and resistance training. People who practiced Tai Chi improved more than 30 percent in lower-body strength and 25 percent in arm strength—nearly as much as those who participated in resistance training, and more than those assigned to brisk walking. – Creates harmony and balance. The goal of this form of exercise is to find the balance in all things. They follow the philosophy of Yin (possessing characteristics such as the feminine, negative, dark, passive, cold, and wet) and Yang (possessing characteristics such as masculine, positive, bright, active, hot, and dry). “Force” (or literally, “fist”) is how one achieves this ying-yang, or “supreme-ultimate” discipline. Through focused, controlled movements, you bring about a sense of balance, alignment, concise motor control, rhythm of movement, and a focus on the center axis of the body. – Calms the mind. These practices are considered meditation in motion. Smooth, slow movements gracefully flow into the next, causing the mind and body to work together. Slowing your movements down slows your mind down and, in turn, gives you a sense of peace and tranquility. If you’d like to explore Tai Chi a little more, check out Tai Cheng™, a mix of classical Tai Chi techniques, ancient Chi Kung practices, and modern corrective exercise patterns that both rehab and prehab the body, improving the body’s metabolism, joint function, stress management, and athletic performance! – Builds muscle. This is a fun, easy way to build muscles. The way yoga builds muscle has to do with the weight bearing poses involved. Poses are held for several breaths, and when you hold the poses, you use your own body weight to place resistance on your muscles. 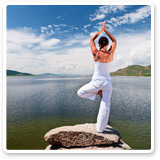 Yoga also offers the benefit of weight-bearing exercise in which your muscle works against gravity. This actually helps build and strengthen bones, creating increased bone density for your upper and lower body. – Calms the mind. Yoga is known for a breathing technique call “Ujjayi.” You inhale and exhale through your nose and create a slight constriction in the back of your throat. This makes a sound similar to waves passing in and out of the ocean and is incredibly calming. The inhale and the exhale are equal in duration. Ujjayi is a balancing and calming breath, which increases oxygen and builds internal body heat. It’s quite beneficial to use off the mat as well. Try it next time you feel road rage coming on. – Strengthens the immune system. Stretching muscles and joints, as well as massaging the organs, allows blood flow to various parts of your body. This aids in the clearing out of toxins from every corner of the body, as well as providing nourishment up to the last point. This leads to the benefits of delayed aging, increased energy, and an unshakable zest for life. Beachbody® has several yoga workouts for you to explore, ranging from the straightforward, meditative Yoga Booty Ballet® session Pure & Simple Yoga, to Tony Horton’s more intense workouts such as Fountain of Youth and Hummingbird, both found in his One-on-One series. While you may think martial arts are just about Bruce Lee beating the tar out of all takers, the truth is that most practitioners view it more as a lifestyle than a form of combat. There are scores of forms, ranging from Jiu Jitsu (a Brazilian wrestling martial art) to Capoeira (another Brazilian martial art involving dance and music) to Akido (a largely defense Japanese martial art) to the ever popular Karate. 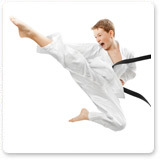 The main purpose of each of these is to teach self-defense and physical and mental discipline. While they all have their own unique benefits, here are a few they share. – Strengthens the body. A set of sequenced routines known as the “katas” are what make up the discipline involved in most martial arts. These hard-style movements are a great source of aerobic and cardio exercise. It is quite easy to build muscle in the grappling sports using your own physical weight to defend against the opponent. When performing martial arts you are able to get a full-body workout, working your upper and lower body equally. – Improves balance and coordination. Balance is required to perform many of the kicks appropriately and is key for landing. Coordination is taught through repetitive movements executed at the same exact place, each time. This improves hand-eye coordination. Balance and coordination can be helpful when defending yourself or even when playing sports. – Increases self confidence. All martial arts teachers will urge you to stay away from physical altercations, but knowing you can defend yourself in any given situation gives you a sense of confidence. My 11-year-old son is a small-framed child and never carried himself with a sense of pride. That is until he joined Jiu Jitsu. After just 3 weeks of classes I noticed a confidence in his character and stature. He even noticed that other children started treating him with more respect and he never laid a hand on them. I began my own journey into the mind-body world of yoga the day my son was born and placed on my chest. The moment he looked into my eyes, I had an awakening of a peace and tranquility that I had not been aware of until that moment. I embarked on a journey from that moment on to seek out ways to keep this peace alive and awake. What I found was a beautiful, holistic approach toward health. I practice yoga every day of my life. With this have come additional benefits. I may be a 35-year-old woman, but I have the insides of an 18-year-old according to my doctor. Regardless of your intentions for practicing mind-body exercise, you will be pleasantly surprised on its ability to quiet your mind and strengthen you physically and emotionally. So, begin your journey today.